EXCLUSIVE CONTENT, BEHIND THE SCENES FEATURES, ALL OUR FAVOURITE THINGS & WHERE TO SHOP! 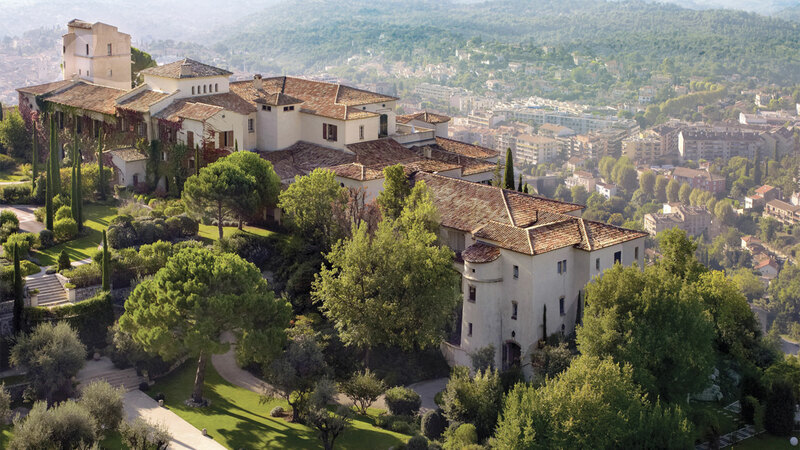 When we heard that one of the prestigious Oetker Collection’s Hotels (and a particularly stunning one in the French Riviera) was being renovated, we couldn’t help but get excited. The 5-star Château Saint-Martin & Spa has had a full makeover just in time for Summer 2018. Think fresh spaces and contemporary style alongside warm tones and the historic Provence charm that we all love. This is the perfect spot for anyone looking to soak up every delicious aspect of the Med. Set amongst picturesque rocky hills and olive groves, above the historical village of Vence, with arguably the most stunning views overlooking the Côte d’Azur, we can see why artists continue to be inspired here. With pretty hill towns and villages nearby and access to a private beach on Cap d’Antibes, locations in the Med don’t come much better than this. Not forgetting of course it’s beautiful gardens, dotted with hundred-year-old olive trees. Enjoy beautifully refined dishes at the Château’s Michelin-starred gastronomy ‘Le Saint-Martin’, or tuck into grilled fish and wood-fired pizza at ‘L’Oliveraie’ in the shady olive grove. Both lead by the talented Jean-Luc Lefrançois, it’s safe to say you will not be disappointed. The 40 rooms and suites at the Château have been restyled with natural wood flooring and inviting linens in soft, pale tones. With no shortage of fresh air, sunlight and stunning views, you’ll be more than happy to sneak back to your room for an afternoon siesta. Or stay in one of the six private and secluded bastide-style villas that sit on the hillside, with one, two or three bedrooms. Renovated and enhanced by renowned Frankfurt-based interior designer and architect, Bergit Grafin Douglas of MM Design, the interior spaces have stayed loyal to the historic Provence charm whilst oozing a new, more contemporary energy, making the chateau feel fresh and alive. All materials have been carefully chosen, including the fabrics and trimmings made in France. Anyone staying at the Château will, without a doubt, be visiting the spa that the hotel is so famous for – The Sisley Spa, which charmingly also includes a treatment list for children. Eden Being, the lifestyle brand of the Oetker Collection, has teamed up with Blain|Southern and launched a series of specially curated exhibitions that will be launched across Oetker Collection’s masterpiece hotels. The series has started with French conceptual artist, Bernar Venet who unveiled seven monumental sculptures at Hotel du Cap-Eden-Roc and Château Saint-Martin & Spa in May and will be displayed until mid October. Bernar, a local to the region, gained recognition in the late Sixties through the avant-garde art scene in New York and quickly became instrumental in developing a radical new proposition in art involving the use of mathematics and scientific language. Founded in 2016, The Caperberry Collective is an online magazine promoting and sharing exceptional and inspirational content. Based in London but created by an international collective of writers, image makers and creatives, Caperberry is the ultimate online destination for the multitasking, creative, engaging, modern woman. It is quite simply the most exciting independent magazine. How do you reach style conscious women who love fashion, beauty, food, travel and interiors? Through us. At The Caperberry Co. we are here to get your business noticed and dished out to the right crowd. We reach a highly engaged audience of in-the-know women on a daily basis.